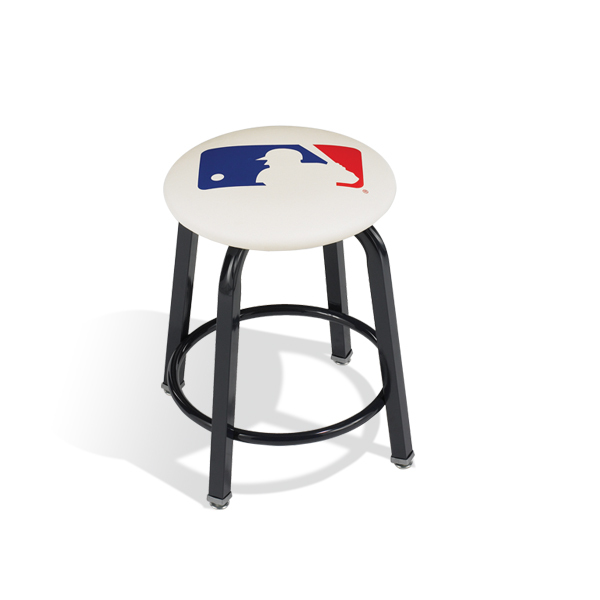 Branded stools for locker rooms, team seating, and a wide variety of other uses make a great addition to you space. Many customization options available! From sporty, short locker room stools to tall bar-height stools, Clarin by Hussey Seating has a stool to fit your needs. Durable and stylish, choose from three round seat heights and an ottoman-style footstool. Match your décor with a wide variety of frame, vinyl and fabric choices. Add a custom logo to the seat vinyl or choose an oak veneer wood seat (round seat models only). 18” (457 mm) high stool with footring, your choice of frame color, vinyl or fabric color and a custom logo. 30” (762 mm) bar height stool with footring, your choice of frame color, vinyl color and custom logo. 24” (610 mm) high stool with footring, your choice of frame color, vinyl color and custom logo. 18 ½” (470 mm) wide stool with your choice of frame color, vinyl color and optional custom logo.